This year, February 5th marks the first day of the Lunar New Year, also called Chinese New Year, celebrated with days and weeks of festivity around the globe! We'll join in the fun today by recommending some great poetry collections and ways to celebrate in your own home. The Lunar New Year is based on the cycles of the moon, so the date that the new year begins changes every year. 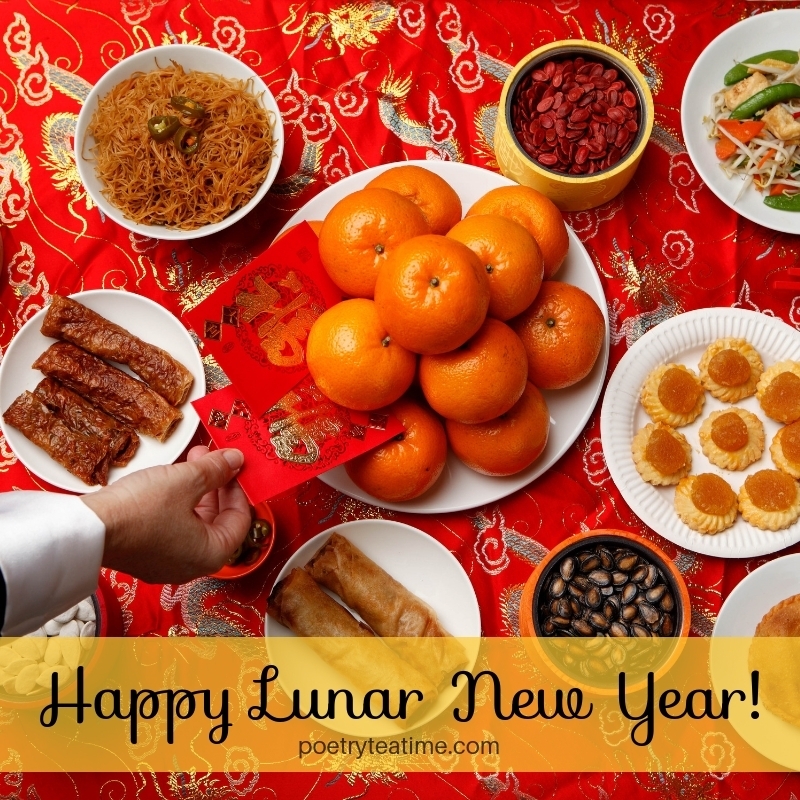 This year, the Lunar New Year starts February 5th and celebrations continue through February 19th. This year marks the beginning of the year of the pig in the Chinese calendar cycle. The pig is the last of the twelve animals in the Chinese zodiac, and is associated with friendliness and generosity. Traditionally, pigs are also symbols of wealth and prosperity. If your family doesn't traditionally celebrate the Lunar New Year, you can still enjoy participating. Read on for some ideas! Check out a local festival: Many areas have Lunar (or Chinese) New Year parades with food, costumes, dancing, and songs for you to experience. Follow a New Year recipe: Set aside an afternoon with the family to learn how to make traditional New Year almond cookies and pineapple tarts with these recipes from JustOneCookbook and Rasa Malaysia. Hang up decorations: One of the most common New Year decorations in Chinese households is the character "fú (福)" or good fortune. However, it's often hung upside down. Find out why here on ChineseNewYear.net and create your own using these directions from Chinese American Family! Wear new clothes: Part of a new year means starting afresh, both physically and mentally. You can do this by wearing a fancy new outfit! Red is considered the most auspicious color for the year, and be sure to stay away from white and black, as they have negative associations. Avoid negativity: In many East Asian traditions, saying words that sound like or are related to bad things like death, pain, poverty, and sickness can bring bad fortune for the year. So focus on health and prosperity in your word choice! Light the house: The Lunar New Year is the time to light up the house, ending with the Lantern Festival on February 15th. You can find cheap lanterns at most dollar stores, but you can also create your own using red construction paper and scissors. Find a pattern here on Red Ted Arts. Serve oranges: In some places, children give mandarin oranges, tangerines, or kumquats to teachers, relatives, and other adults as a sign of thanks and respect. They are also associated with good fortune. Make sure to enjoy some during your teatime! If you would like to know more about the many, many other New Year traditions we didn't have room to include here, such as red envelopes, be sure to check out these resources on Chinese American Family. And remember, the Lunar New Year is celebrated in many different ways in different communities around the world. There are plenty of traditions to discover! 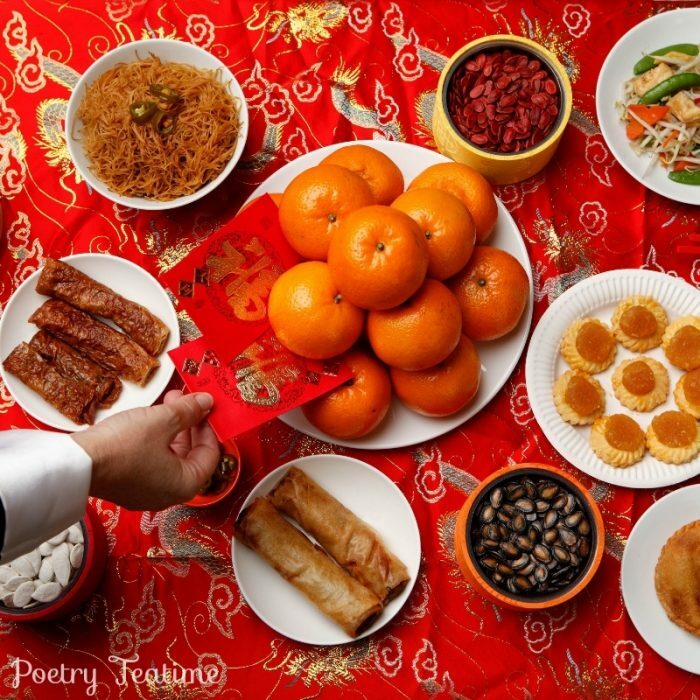 Check out these wonderful poetry book collections to help you get into the Lunar New Year spirit! Although some of these books talk specifically about Chinese celebrations, you can also find information about the ways different people around the world celebrate the Lunar New Year.